The tear was difficult to detect amongst the sweat. Harsh, unflinching eyes dark pools into the depthless turmoil of a lifetime of hard labor and dwindling potential. His good shirt clung to his wiry frame even as the corded knots that were his shoulders sagged, betraying a bone-deep exhaustion. Hands stained by sun and soil clenched a hoe, the strain of the day evident in his involuntarily tight grip on the worn, sun-bleached handle. The drone of insects was as constant as the perpetual bead of perspiration that clung to the tip of his nose. His two and third acres stretched away from the rough track that wove past his home. A rushing stream gnawed tirelessly at the far corner of the field; rain-engorged waters plucked away at this livelihood, year after year, an annual tax to the gods after the season's heavy rains. Those acres were stony and rife with weeds, but they were his. They were all he knew. His cassava, his sweet potatoes, his melons. His life. Twelve days since the harvest, two since the last of it sold. As ever, it was not enough. Not nearly. Still, what did that matter? The mortgage was due, his roof needed mending, the soles of his boots could use some attention, and the seeds wouldn't sew themselves. The list of life's demands grew with each passing season, settling their weight upon his soul. Maybe once the planting was done he could catch on with a fishing boat on the coast while the rain and sun and soil did their work. His crops were hardy, and a few weeks away wouldn't kill them off. The pay was sporadic out there, but occasionally lucrative. He knew it for a fever dream, but at this point he had few others. Had it always been this way? This hard? It was difficult to say how much time had passed as he stood there. The tear, once discernable, had blended into the moisture of his upper lip. 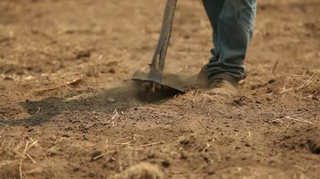 His right hand released its hold on the hoe, leaving the metal head to bite into the rain-soaked loam, breaking his reverie. Regaining his grip, he slowly returned to the task at hand. What Do We Know About Joe Wolf’s Dairy Queen Franchise?